Worldwide investment in renewables and other low-carbon energy sources dipped 8% last year to $332 billion, according to the consultancy BloombergNEF. The ongoing drop in capital costs for the technology, fueled last year by a glut of panels on the market. Policy changes in China, the world's biggest market, that lowered federal support and helped cut investment there by around half to $40 billion. "However, we estimate that global PV installations increased from 99GW in 2017 to approximately 109GW in 2018, as other countries took advantage of the technology’s fiercely improved competitiveness." 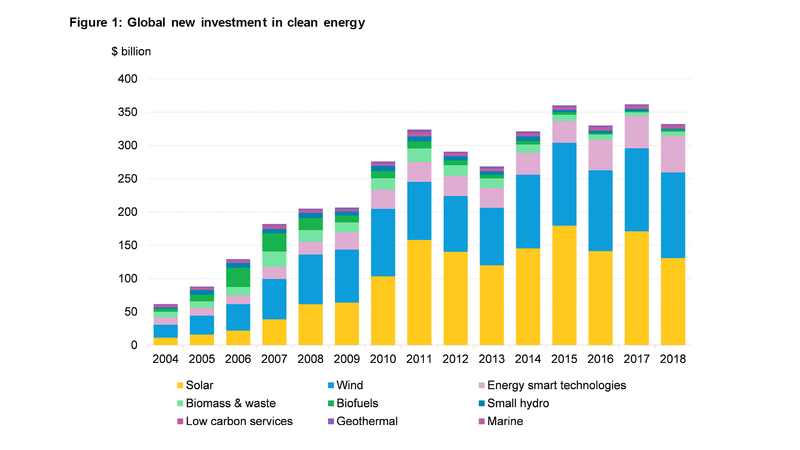 The big picture: Worldwide investment in clean energy has soared over the past 15 years from less than $62 billion in 2004 to consistently far above $300 billion over the last half-decade. But while renewables deployment is surging, it's happening alongside rising global energy demand and growing fossil fuel use too. That means the renewables surge isn't yet big enough to start sending global CO2 emissions downward. Offshore wind investment grew by 14% to nearly $26 billion, while onshore wind grew slightly to around $101 billion. Corporate R&D spending slipped 6% to roughly $21 billion, but government R&D rose 4% to $15 billion. "Global venture capital and private equity investment jumped 127% to $9.2 billion, the highest since 2010," BNEF says. Go deeper: See more of the data here. Remember that brief moment in late 2018 when the U.S. became a net exporter of crude oil and petroleum products combined? It was just a preview of what's to come late next year, according to the Energy Information Administration's first detailed 2020 market forecast. America’s largest oil-industry groups are launching a new coalition to lobby in support of new global standards that tighten air pollution regulations for shipping fuel, Axios' Amy Harder reports. Why it matters: This is a classic example of business using regulation to gain a competitive edge over others. Many of America’s oil and refining companies have been anticipating these rules — set a decade ago by an arm of the UN that oversees maritime issues — and moving toward low-sulfur kinds of diesel fuel. 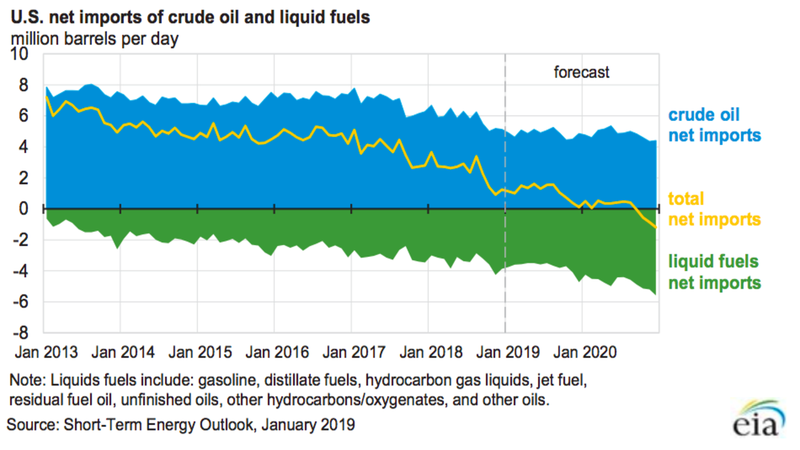 The big picture: The global standards are forecast to increase prices of diesel, gasoline and oil in the coming years, according to an EIA analysis Tuesday. Read more of Amy's full story. "The employees are working in four areas: geological testing for offshore oil and natural gas in the Atlantic Ocean; the administration’s proposal last year to allow offshore drilling in the Atlantic, Pacific and Arctic oceans; environment review for that proposal and preparations for two upcoming offshore drilling lease sales in the Gulf of Mexico." Tech: The Financial Times reports, "Chevron, Total and Reliance Industries are backing a new digital platform for crude oil trading based on blockchain and launched late last year, joining a consortium of investors that includes BP, Royal Dutch Shell and Equinor as well as traders Gunvor, Mercuria and Koch Supply & Trading." EPA's plan to regulate carbon dioxide from coal-fired power plants would lead to CO2 emissions increases as high as 9% in 18 states in 2030, despite driving a modest nationwide cut, a new paper in the journal Environmental Research Letters concludes. "Our new study ... calls into question whether the ACE rule can meet the legal requirement of a best system of emission reduction under the Clean Air Act given that it is projected to cause an increase in CO2 emissions at 28 percent of the regulated plants." The big picture: The Trump administration proposed the rule in August to replace a more sweeping Obama-era climate regulation that never took effect. But the study projects that its push for greater coal-plant efficiency could lead to a "emissions rebound effect" that boosts overall CO2 and conventional pollution from some power stations. "When a plant becomes more efficient, it has lower variable costs, and is likely to run more frequently and have a longer lifetime," the post states. "Although the ACE reduces the emissions intensity of coal plants, it is expected to increase the number of operating coal plants and amount of coal-fired electricity generation, with 28 percent of model plants showing higher CO2 emissions in 2030 compared to no policy." "We also find that the ACE increases SO2 and NOX emissions in nineteen states and twenty states plus DC, respectively, in 2030 compared to no policy, with implications for air quality and public health." What they're saying: The new episode of Energy 360°, a Center for Strategic and International Studies podcast, explores why some activists aligned with the GND movement are not emphasizing carbon pricing. "You certainly get a sense that within the climate change realm, there is a desire to find something that is a little bit more direct and certain than a market-based approach," notes CSIS' Sarah Ladislaw. "If environmentalists believe that renewable energy will triumph in the end, they lose nothing by allowing the GND to simply target 'carbon-free energy.' In practice, that will prove to be renewables, right? So what’s the problem?" In the states: Greentech Media reports on another sign of the rising cachet of the Green New Deal tag, which of course isn't a trademark and can mean whatever a given backer wants. They write that New York Gov. Andrew Cuomo's office announced "New York’s Green New Deal" on Tuesday. "The plan, outlined in Cuomo's 2019 Justice Agenda, calls for a 'globally unprecedented' ramp-up in renewable energy deployments as New York seeks to achieve 100 percent carbon-free electricity by 2040, and ultimately eliminate its entire carbon footprint," Greentech reports.